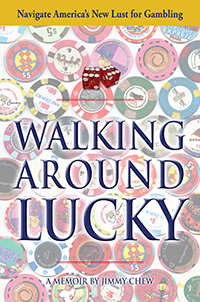 Jimmy Chew, an expert at the art of winning gambling games, recalls his life and times in an anecdotal journey through six decades of his career. Walking Around Lucky is full of personal tales and gambling stories with legends the likes of Mantle, Snead, Trevino, Floyd, Eastwood, Wadkins, Jacoby, Holland, Walters, Baldwin, Ungar, Brunson and others. Look inside the mind of an old school gambler to see how his experiences from childhood onward molded him into a world-class competitor at a number of games. Learn how sports betting rears it’s ugly head and what you can do about it. Hear stories about big wins and excruciating losses at golf courses, sporting events, casinos and courtrooms. Best of all, you’ll get a front-row seat to “Jimmy Chew” Blackjack, a self developed system of betting that utilizes the ebb and flow of luck to ride a hot streak all the way to the bank. The author’s methods caused him to be banned from a major Las Vegas casino for winning without ever counting cards. Conversational, delightful, and accessible, Walking Around Lucky is the inspirational true story of a man whose life has been an adventure like no other.